This is an uranium mine belonging to Rio Tinto (about 70%) and to the government of Iran (15%). It is near the new town of Arandis. Since the apartheid era there are allegations of health damage to workers at Rössing. 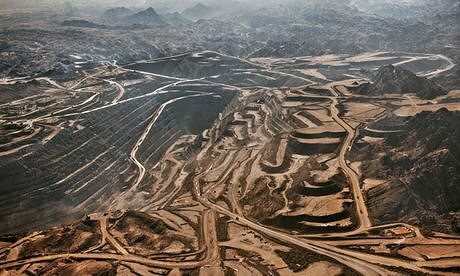 This is a controversial uranium mine belonging to Rio Tinto (about 70%) and to the government of Iran (15%). It is near the new town of Arandis. In the apartheid era there were allegations of health damage to workers at Rössing. There was an attempt to claim damages in a court case in London. By the early 1980s, UK was importing nearly half its requirements from Rössing alone (Moody, 1991). The deal induced an international Campaign Against the Namibian Uranium Contract (CANUC), which brought together the Namibian independence movement, the antiapartheid movement (the deal was in breach of UN decisions), and “Partizans” (People Against Rio Tinto Zinc and Subsidiaries), a London based grassroots organization. The mine employs about 500 people. It is the fifth largest open pit uranium mine in the world. There were plans around 2007 to invest another US$112 million. The main target was to increase uranium oxide production to the mine's full planned capacity of 4,000 tonnes, and this was achieved. Expansion plans are expected to extend the mine's life to at least 2016. EJOLT has done research on radiation risks and on the health of former workers at Rössing. EARTHLIFE Namibia and CRIIRAD (Commission for Independent Research and Information about Radiation) have organized visits and measurements in areas located in the vicinity of uranium mines in Namibia, especially Rössing. The preliminary findings – submitted on April 10 to the National Radiation Protection Authority – should give reason for concern about uranium mining in Namibia. The dose rate measured in 2011 by CRIIRAD on the parking of Rössing mine is about 6 times above natural background value. The finest fraction of the radioactive rocks is washed down by rain water and contaminates the sediments of the Khan river: with values 10 times above those measured in sediments collected in Khan river upstream. Project Details Rössing is a low-grade ore body of huge extent. Producing 1,000 tonnes of uranium oxide requires processing of 3 million tonnes of ore, and in 2005 19.5 million tonnes of rock were mined and transported from the open pit to the processing plant. Of those, 12 million tonnes were uranium ore, which in turn required 226,276 tonnes of acid for processing into yellowcake, a powdered uranium concentrate which is the basis for nuclear reactor fuel. Why? Explain briefly. The health damage to uranium miners has not been compensated for by Rio Tinto, it has not even been acknowledged.